Dagens kort er til Pattie's Creations Challenge #11 som en del af design teamet. Temaet er SORT, HVID og 1 extra farve (hudfarver er ikke ekstra farver), og der skal bruges et digi image et eller andet sted på arbejet. Jeg har brugt 'Three Daisies' farvelagt med Copic og derefter embosset med gennemsigtig farve og sværtet. Skitsen fra 365 Cards med ordene Friendship, Focus, Courage, Strength, Serenity, Joy som inspiration; Focus on black/white/one color, Strength; black reflect strenght, Joy; its a joy looking at the flowers. Thanks for joining us this fortnight over at Craft Your Days Away! Linda - another gorgeous DT creation from you! Very nice! Love the tulle bow! Thanks for joining us at Craft Your Passion in our "Button It Up" challenge! 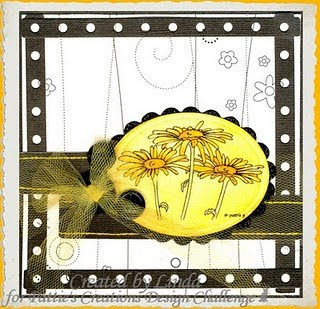 Linda, I just love how you composed this card! The coloring is Fabulous. I have an award for you at my blog. I hope you will grab it and pass it on.